The foundation stone of the present church of Hobkirk – or “Hopekirk”, meaning church of the hope or “sheltered place” between hills – was laid in 1862, near the site of churches built in earlier times. The Church lies about three-quarters of a mile north of the village of Bonchester Bridge, where the valley of the Rulewater narrows, and is some eight miles from Jedburgh Abbey. 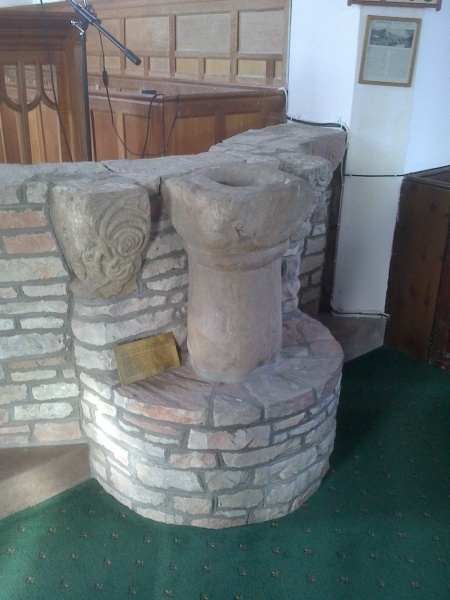 Possibly the most interesting feature of the present building is the original baptismal font, which was given by Captain Brown R.N. of nearby Weens in memory of his wife, and which was dedicated in 1937. The font incorporates stones belonging to ancient churches that stood successively on nearby sites. The principal stone, which now holds the font basin, is believed to have come from a pillar in a Saxon church of the 9th century – that is, some eleven hundred years ago, from a period when crowds still gathered to celebrate the vigil of St Cuthbert in the local Chapel of Slitrig, and when the protection of the Saint was still sought against wolves and invading Danes and Norsemen; when Alfred the Great was a boy. That church was destroyed and another built before the days of the Norman Invasion, while the Celtic influence was still strong in the art of this region – as indicated by the capitals of Celtic design built into the wall of the font. And at the same time, the builders took from the ruins of the first church the portion of the old Saxon pillar, hollowed out the top, and cut a hole in the basin and a drain down the back, building it into the wall of the apse for use as a basin in which to rinse sacred vessels. This church too was destroyed and another built in around the 13th or 14th century, of which the outer capitals in the walls of the font are witness. Then this church fell, and in 1692 a comparatively plain and simple building with a clay floor and thatched roof was erected, which stood until 1862 when the present church was built. The ancient ornamental stones that had been built into the walls of the 17th century building were carried away to stand in gardens and rockeries, until being gathered together once more and built into the present structure to the glory of God and as a memorial, as the brass plate in the pavement tells. These stones were not put into the font as mere museum pieces. They keep us in touch with the great things that happened long ago with the help of men great and small whom God guided, helped and inspired to plant and foster the Christian faith throughout troubled and often violent times. 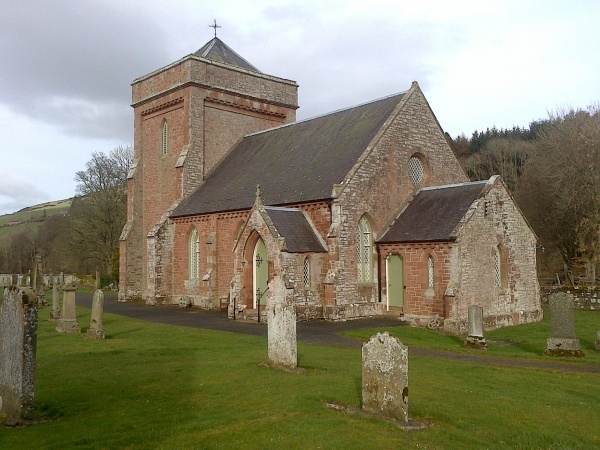 It is believed that the ancient parish name of Hopekirk gave rise in time to the surname Hopkirk; and as is so often the case with old surnames, many variations are now to be found, including “Habkirk” and of course “Hobkirk” by which the parish is now known. Interestingly, the church itself is sometimes still known locally by the original name, as indeed is the nearby schoolhouse. 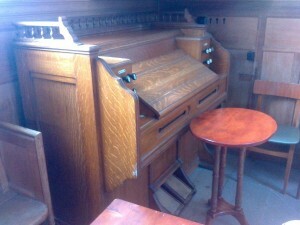 The organ in Hobkirk Church is a Viscount Jubilate electronic organ. It was a much needed replacement for a Yamaha Electone instrument, and has been a great improvement to the quality of music played in the services. In addition to the console with its built-in speaker, there is an external speaker in the chancel which gives the organ a much more realistic sound. The organ loosely follows the disposition of a German baroque instrument, though has stops such as a vox celeste on the swell division which allow for a little more flexibility. There is an abilility to change the overall voicing of the instrument from a `romantic’ sound to a `baroque’ one (though this is rarely necessary given the brightness of the default sound). A full chorus is available on each of the three divisions, as are reeds and flutes. These add to the variety of sounds available for hymn accompaniment, and add to the possibilities of repertoire for service voluntaries. Due to the substantial pedal division and contrasting choruses on the manuals, it is possible to properly play works in the `organo pleno’ style, and with the mutations on the swell play french classical literature with some degree of authenticity. Naturally the sound is not that of a genuine pipe organ, but a pipe organ is simply not an option in this case, and the sound for an electronic instrument is admirable. The flutes and diapasons have attack while the reeds add richness and brightness to the sound.